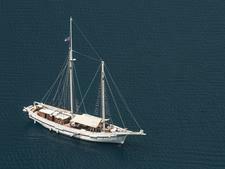 Meta IV is a classic wooden two-masted yacht designed by the famous American naval architect Thomas E. Colvin and made entirely of Thai teak. It is now part of the 10-strong fleet owned by Burma Boating and provides accommodation for eight passengers and four crew members. Originally constructed as a private yacht for a Swiss businessman, the vessel came into the Burma Boating fleet after line co-founder Herbert Mayrhauser spotted it at a pier in Phuket in 2010. After two years of intensive restoration work and refitting, Meta IV started a new life as a luxury charter vessel in fall 2012. The four passenger cabins are air-conditioned and have en-suite bathrooms and electric toilets. Two cabins have queen-sized beds, while the other two feature twin beds. The stateroom situated behind the cockpit can sleep three. The entire aft of the boat is shaded and fitted with dining spaces and sunbathing areas. The ship has a RIB dinghy. The boat's center is dominated by the galley and indoor saloon dining area. Meta IV sails on five-night cruises and private charters in Myanmar's Mergui Archipelago.Cruises include all onboard meals, water and nonalcoholic drinks. 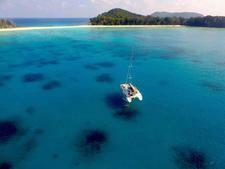 The best time for sailing the Mergui Archipelago is between November and the end of April.